Welcome to SCUBA News. Creature of the month is back in this issue, plus our diving news and offers. When is a Sea Snake not a Sea Snake? Who to dive with in Hurghada? Divers rate and review the dive operators in the Red Sea town of Hurghada. Brazil's offshore diving has warm water, caves, spectacular rock formations and many, many reef and large pelagic creatures. A hot spot for sharks and manta rays. Malaysia has some world class diving, including the famous Sipadan which features in the top ten dives of the world. As well as sharks & turtles Malaysia is also famous for its macro-life. 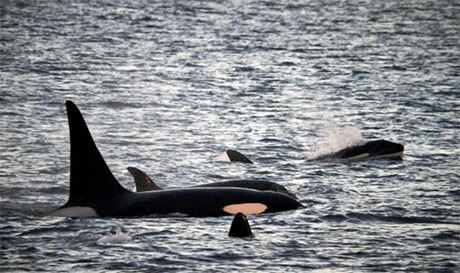 Join Norway's Sula liveaboard for a unique chance to swim with orcas & humpback whales, and see the Northern Lights. When it's in the Red Sea. 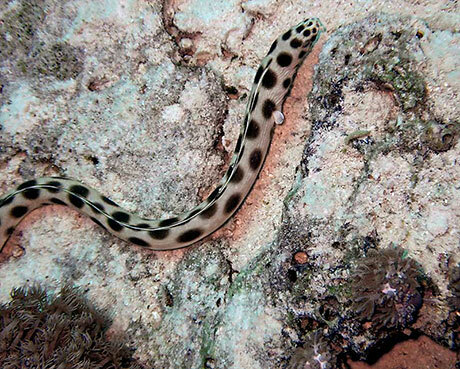 Our creature of the month is the Spotted Snake Eel, Myrichthys maculosis. This eel occurs throughout the Indo-Pacific and it is often mistaken by divers for a sea snake. However, if you should be in the Red Sea and see what looks to be a sea snake you can know for sure that it is actually a snake eel. This is because there are none of those venomous reptiles in the Red Sea. Scientists think that this is because the Red Sea is too salty. The snake eels are an interesting group, seen much less frequently than the morays. 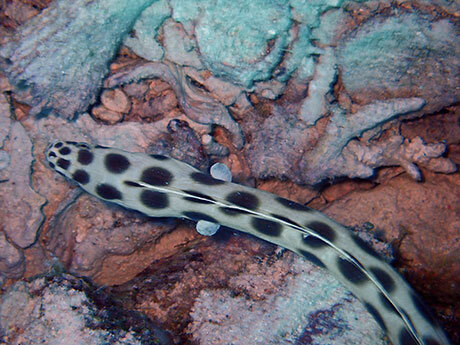 The spotted snake eel can grow up to 1 m long, but is usually less than half that length. It generally lives at depths between 1 and 25 m. However, it has been found 262 m down. You see it most often on sandy areas by reefs. Feeding on fishes and crustaceans, it hunts by sense of smell. Like a lot of snake eels, when not hunting it burrows into sand. The tip of its tail is hard allowing it to dig down backwards. The eels live in the Indian and Pacific Oceans down to South East Australia and South Africa. They are also known as tiger snake eels or oscellate snake eels. Diving hotspot Palau is the world's first country to ban sunscreen lotion containing environmentally harmful ingredients. Up to 50% off on liveaboards around the world. The buttons on the BCD inflators can break or leading to a rapid loss of air or auto inflation of the BCD and the possible drowning of the diver. Is autonomous shipping the future for the maritime industry? Due to the scale of the maritime industry, shipping is a major contributor of carbon emissions. An autonomous ship is the first zero-emissions vessel. The new Socorro Aggressor liveaboard launches in December and transports scuba divers to encounter great white sharks at Guadalupe or giant manta rays, humpback whales, dolphins and sharks at the Socorro Islands in Mexico.